Troxel Helmets Home Testimonials Love the Intrepid! This was Mother's Day, 2013 and I was showing my young Morgan at a schooling show at my barn. I had bought a Troxel Intrepid not too long before the show so I opted to wear it rather than my normal velvet hunt cap (non-ATSM). I don't remember the fall, but from what I'm told, Aries did a Lipizzaner-style leap into his right lead. I lost my stirrup (I think) and wasn't able to recover my balance. Finally came off and apparently he caught my head with a hoof on the way by. 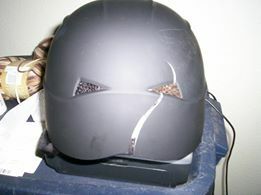 Cracked my helmet in two places and you can see a little where his hoof hit it. I did end up with a slight concussion, but was able to finish out the show and the day. The story would have been entirely different had I been wearing the hunt cap.